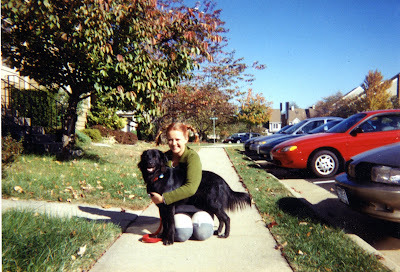 Be forewarned that this is a long, rambling post about my dog. There's no talk about food. There's no art. Just some memories of Cleo. Yesterday, we had to put our dog Cleo to sleep. Some sort of internal growth (probably cancerous) ruptured inside her; the internal bleeding weakened her to such a degree she became paralyzed and disoriented. Because further exploration and surgery would only cause significant pain for little purpose, we decided to let her go. I was with her, petting her nose and ears as she went away. She slid away so quietly and gently it was hard to tell when she left. It was good to see her calm and resting after a day of distress. We knew we would lose her sometime soon. 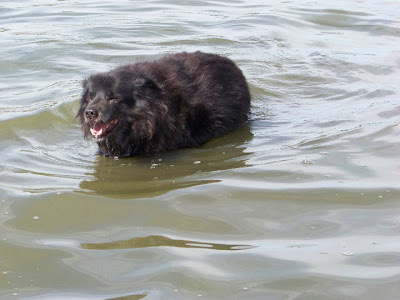 She was 14 years old, a ripe old age, especially for the big dog she was. 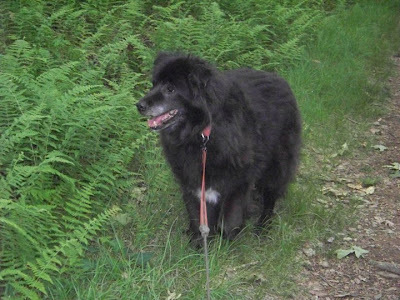 She had slowed down over the last few years, but she seemed generally healthy for such an old lady that we hoped to get another year or two. Despite the shock of losing her so suddenly, it was probably best this way: A long healthy life, and then one precipitous event to bring it a swift and relatively painless close. Better than a long-suffering grind anyway. But I don't really want to rehash the pain of yesterday or define the hole she leaves today and tomorrow because the hole is what it is. Instead, I want to try and capture some memories and get a sense of her life before time fades it away too much. 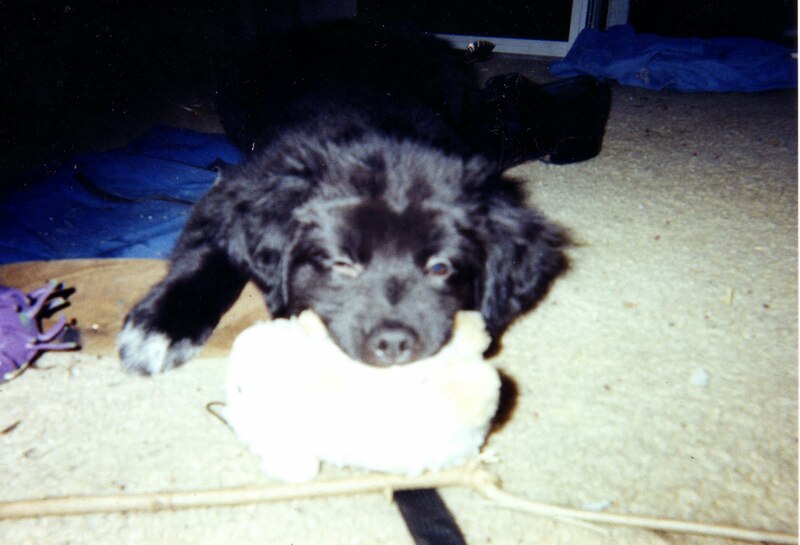 We got her about a year after we were married, in late 1997, from some friends whose dogs had had a pretty large litter (eight, I think?). 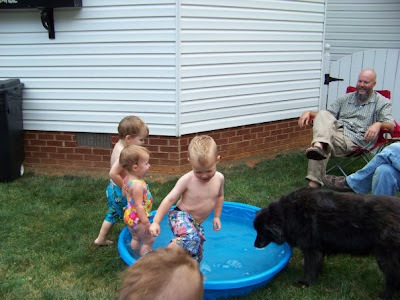 When we went to visit the puppies, we didn't have any plan to get a dog (we were living with Mike's dad at the time). We just went to see the puppies. Of course, we fell for them. 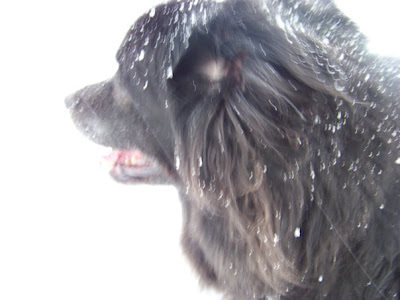 Especially one of a pair of black woolly bears whose name was Cleopatra, which seemed particularly auspicious to me because when I had been a baby in Africa, my family had had a dog named Cleopatra who guarded over me. 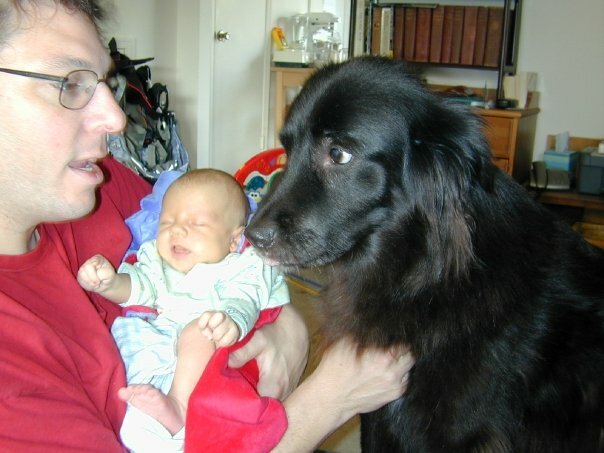 When we got her, she was a tiny thing that Mike could hold in one hand. For the drive home, I stashed her under my coat to keep her warm and make her feel safe. One of the funniest memories we have from when she was a pup was when she got her head stuck in Mike's boot. Mike was working at Cox Farms at the time and typically wore big old overalls and steel-toed boots. At the end of the day, he'd come home, pull them off, and drop them on the floor, and we'd hang out with Mike's dad in the kitchen. One day, Cleo got curious about what was inside those boots, went over to one of them, started sniffing around, and shoved her head into it. Her head promptly got stuck in there, and she lurched around the kitchen, banging into the furniture like some strange four-footed boot-headed creature. We tried to get it off but we were laughing so hard, we could barely move. (I also tried to get a pic, but once again, laughing too hard to focus.) When we finally got it off, she gave us a rather reproachful look like, "Hey guys, where were you!?" She had an incredibly expressive face. See? 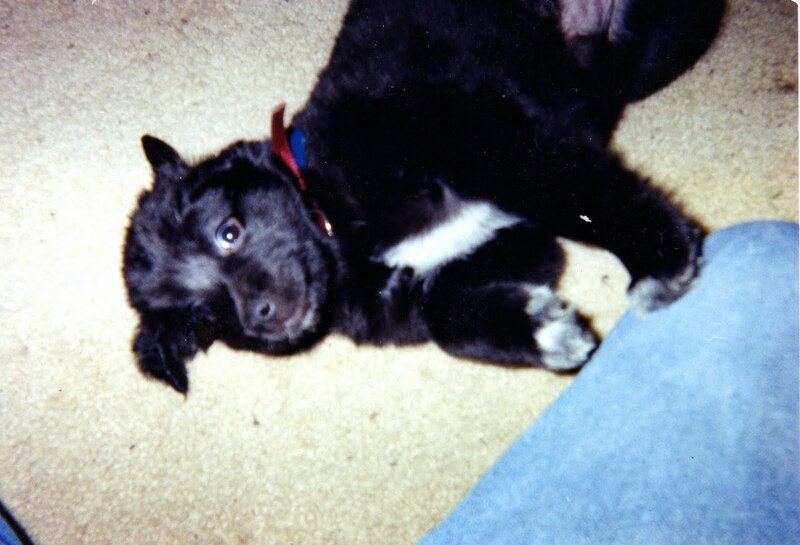 As a puppy, she was a complete terror with my shoes. I didn't have many at the time. We had very little money (we were, as I mentioned, living with Mike's dad), and I had not yet developed that strange addiction to shoes so many women have, so I had maybe three pairs in total, including a snappy pair of strappy white satin heels I had worn to my wedding. Cleo destroyed them all, including the wedding shoes. The others didn't bother me so much, the wedding shoes were a disappointment. Still, she didn't eat the dress or the rabbit, so I suppose we lucked out in the end. She grew up to be a beautiful sleek shiny dog with a slightly curved tail with a curtain of hair. Every time we took her for a walk, we would get compliments on how beautiful she was. People would also always ask about her breed, and we'd tell them with great pride she was a mutt (just like us). 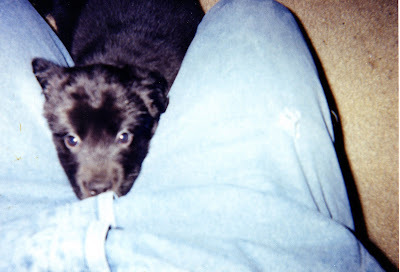 Her mom was a full-blood black German shepherd and her dad was half Husky, half Doberman. Here she is, just grown up, on Halloween in 1998 (I am dressed up as Pippi Longstocking to work at the Cox Farms festival--later that day, I drove a tractor for the first and only time in my life). She was so good with Sebastian, so patient, so tolerant. I don't think she really liked him all that much at first, but as he grew older, she definitely grew more affectionate with him. She was really good with most kids, actually. 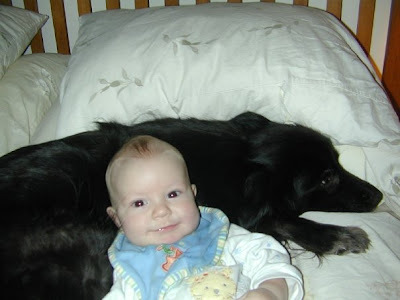 When our niece Emily was about four years old, she spread a blanket on the dog and then laid down on top of her like a pillow. Once again, she calmly accepted it. I think she had a great tolerance for discomfort if it was part of an expression of love. Like a mother who patiently lets her child pull her hair, she was gentle with little ones. Bringing the cat home bore mixed results. Cleo was less lonely and bored, but the cat terrorized her. Winslow would do things like hide in a hallway when the dog ran by and try to grab onto her tail, which was hilarious but annoyed the dog. Still, they eventually formed a sort of friendship and trust. They would sleep together, and the cat would clearly miss her when she went away with us for a weekend. There's so much more to tell about Cleo. 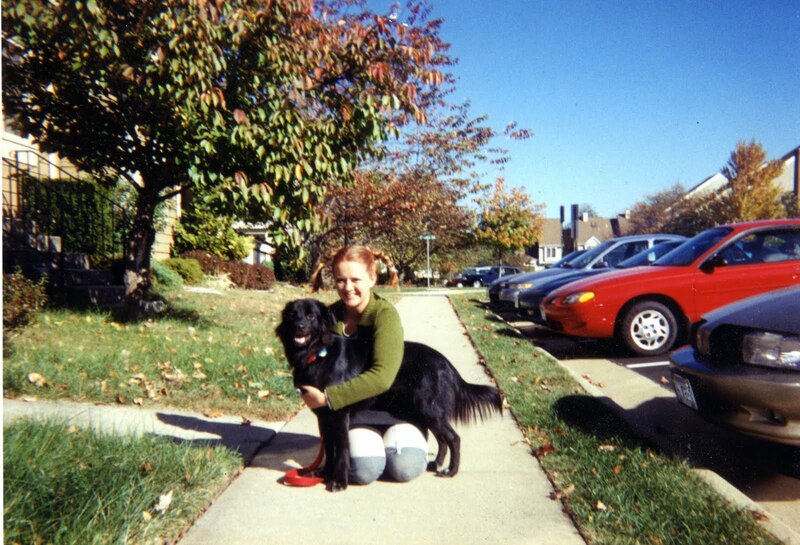 We had her for 14 years, almost all of our married lives together. She was often too sweet for her own good. 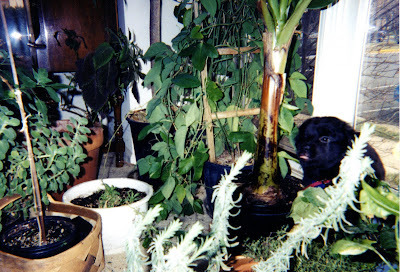 But she could be a sneaky little devil too, stealing food (like the time she tried to grab the Thanksgiving turkey off the table or the time she swiped Mike's first grilled chicken) or shoes, hiding them in the garden or in one of her special places. She loved having her chest rubbed and her ears fondled. She was dutiful, protecting her pack from strangers by barking at anyone who came to the door. 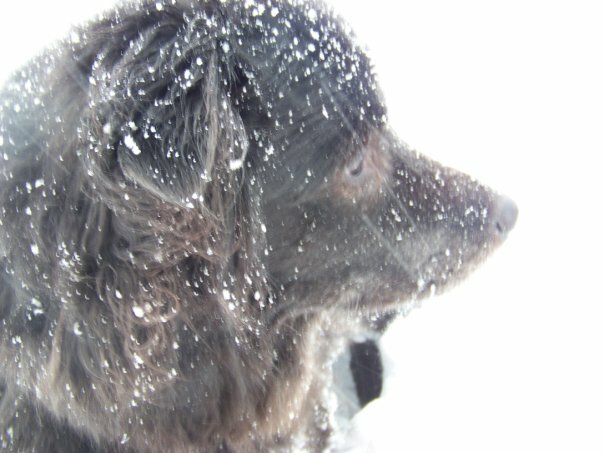 She was a lovely dog whose presence had become a constant in my life. I will miss her.